As Jon McComb greets this reporter in the lobby of Corus Entertainment on West Georgia Street, no introductions are needed. It’s a voice that’s been heard on air for almost 50 years, first as a DJ, later as a news broadcaster and finally as a speaker and vocal advocate for people living with a mental illness. McComb says his empathy for anyone living with a mental illness comes from his own struggles with anxiety and depression. “It was around 2010, 2011 when I started taking about mental health and for all the reticence and fear I had at the time about anyone finding out, then they couldn’t shut me up,” McComb, says laughing. On Dec. 1, McComb will have been with CKNW news radio, a division of Corus, for 35 years, the last five hosting the morning show — the early morning show he took over from long-time radio host Philip Till. McComb’s morning show team includes producer Pippa Reed, co-host Niki Reitmayer and tech producer Greg Schott. McComb starts the day with a protein/vitamin energy drink, followed by a cup of coffee before getting behind the wheel to make the drive from North Vancouver, where he lives with his wife Kristin McComb. The couple shares four kids, five grandchildren and four cats. McComb says regular listeners know their oldest son Scott is living with ALS. Congratulations to one of the best on air personalities that ever broadcast in Vancouver. Jon is right up their with all the greats that worked at NW over the years. His days on the pm drive debating with Phil Till were memorable and often funny. 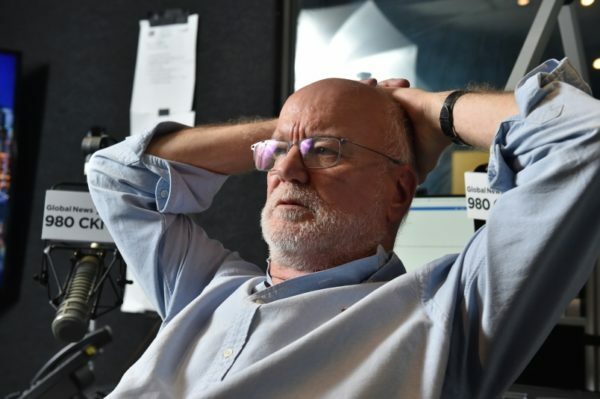 His ability to adjust and soldier on at a radio station that has been downsizing for the last 17 years has managed to keep him at the top of talk radio in Vancouver. For the past few years I have found that NW has moved from the middle of the road to the left lane. Not sure how comfortable JM is driving in the left lane, but of all NWs” regular” show hosts he is still the most balanced. I do not know John, but his advocacy for those stricken with mental health issues, including his clarity of those issues that afflict the DTEastside, I believe will be his legacy. He has used his personal circumstance and enormous public platform to help us understand the less fortunate. It is not ‘right’ or ‘left’ leaning, but rather a sign of character, and a true moral compass. Good for Jon and his 35 years and all his hard work, but don’t count me in as a listener. I changed my morning routine 5 years ago when he signed on. I don’t like his politics or his on-air demeanor. Jon, Congratulations. However, I don’t like the morning format anymore for many reasons, but what really bugs me is his new sidekick Nicki Rightmyer. Sorry, I just can’t stand listening to her, and that not so subtle laugh… Among other things.